On June 27th Aspire will debut a new daytime chat show featuring Issa Rae, Angela Burt-Murray, Rene Syler, Malinda Williams, and Erin Jackson. 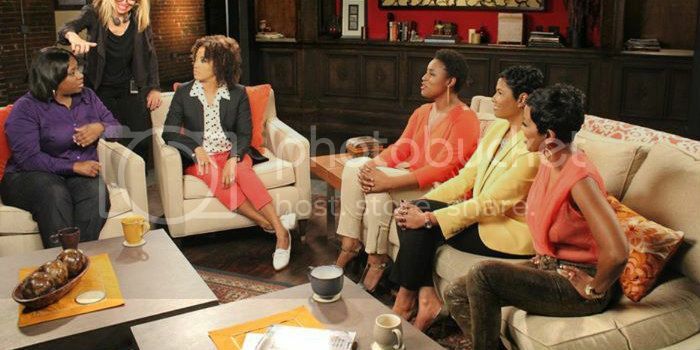 Exhale will see the women candidly discuss hot topics and interview guests. Check out a sneak peek of the show below. Angela Burt-Murray: "I think of myself as a journalist, wife, mother -- someone who's just interested in telling different stories." Malinda Williams: "People think they really know me, but I think once they start watching Exhale they're going to find out some things about me that would probably surprise them." Rene Syler: "I'm a wife. I'm a mother. I'm strong. I'm resilient. I'm funny. I'm creative. Good-looking duh." Issa Rae: "I am a producer, writer, and director. I created an online webseries called "The Misadventures of Awkward Black Girl." Erin Jackson: "Erin Jackson is Jersey girl transplanted to DC. I'm a stand-up comedian. Being on stage and seeing people laugh their heart out brings me joy." Issa Rae: "We offer a new vision on life and the issues. It's really refreshing to be able to hear from women I can relate to."